The electoral consequences of variations in economic growth on vote volatility are analyzed on a panel of fourteen Indian states between 1957 and 2013. Two measures of volatility are used: first changes in party vote shares at the assembly level and the state average of volatilities constructed at the constituency level. While the results suggest that both volatilities are reduced by higher income growth rates, volatility at the constituency level is found to be somewhat more sensitive to growth rates. Examination of the periodicity of income growth’s impact finds that the growth rate in the final year of governance has a stronger effect on volatility than does the average income growth rate arising over the entire election cycle. We also find that vote switching responds more to negative rather than positive growth changes and, by decomposing volatility, find that growth changes affect internal vote shifting more than between established parties and new comers. More generally the responsiveness of volatility to set of economic and political characteristics of the state suggests that theories of economic voting have an important role to play in understanding electoral outcomes and hence the process of development. Dash, Bharatee Bhusana, & Ferris, J.S. (2018). 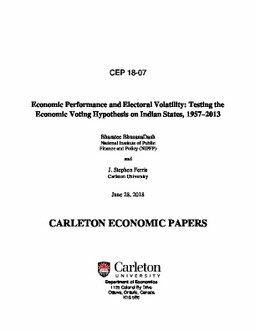 Economic Performance and Electoral Volatility : Testing the Economic Voting Hypothesis on Indian States, 1957–2013 (No. CEP 18-07). Carleton Economic Papers (CEP). Department of Economics.